Although I might not look like that from outside, I’m quite a nervous person, with constant battles going on within me, involving fears, sometimes depression. I don’t always feel like that, but quite often. That is also the main reason why forthe last 15 years or so I’m practising relaxation methods. At a young age, I realised that calmness of the mind is the key to fighting nervousness. When I was around 20, I started to read books on spirituality and mental health, and one particular book about Zen methods stuck in my mind. The ability to be in the present. That resonated a lot with me, so since then, I spent a lot of time researching techniques which can help me to get my mind in that state of calm. It turned out; it’s not that easy. I started relaxing at age 27, almost 15 years ago, and the first year or two I felt minimal benefits, but I persevered, mostly because I trusted my teachers and I saw other people getting good results. Eventually I began to get into it; I was feeling the energy flow, the warmth, suddenly I was able to calm my brain and enjoy the present moment. So, it did get easier, but it was always challenging. I would say in 90% – 95% cases I would have to battle some nervousness during relaxation, sometimes I would get rid of it successfully, sometimes not. I observed my nervousness carefully and realised there are two types. the first one is the obvious one, the nervousness which is related to a particular event or situation happening right now in your life. It might be a problem at work, or conflict with a person, some anxious thoughts about health, a family member, etc. 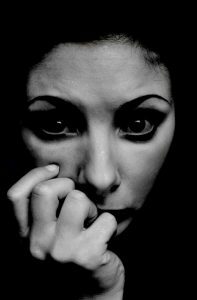 We all know this type of nervousness, it’s something that keeps us awake at night and takes a lot of our mental strength. And not just mental. In this case, when I relax, I have to think about a more positive scenario to resolve my troubling situation and put it mentally aside. It is not easy, but in most cases, after 10-15 minutes I’m able to do that. The major benefit here is that after you are done with relaxing, it’s very likely that you will have an entirely new, fresh view on your situation, and it’s likely that you will also have a ready solution or at least a plan. The other type of nervousness is more tricky; I call it genetic nervousness. The source of this kind of nervousness is probably far more complicated than just genetic, but let’s keep it simple for this post. Genetic nervousness is the mental and emotional discomfort for which we are unable to find the exact cause. We feel irritated, everything seems wrong, but we can’t pinpoint what. When we examine a situation we realise that everything is actually fine, but somehow we are not settled, and often we can be a nightmare towards people around us because they also can’t see what the problem is. This type of nervousness is very likely caused by our genetic, a disbalance of organs or disturbed flow of energy. Dealing with this kind of nervousness is far more challenging, and it requires proper relaxation skills to be able to go over it. In most cases all we need is time, and if we find ourselves unable to relax, we should focus on basics, which is to relax our body and try not to engage in any tasks, unless they are something fairly relaxing. Eventually, this nervousness will subside. Physical exercises can help as well in this kind of case because often we just lack circulation and need to release some stagnation. Drink plenty of water and eat healthy and fresh and don’t worry if you can’t relax right away, just be aware of it and let it pass. The Genetic type of nervousness can quickly manifest into a physical problem, so you shouldn’t ignore the symptoms. Take the time for yourself and to relax, that is the best form of prevention and long-term cure.